Anne James has been a member of the Gloucestershire Guild of Craftsmen since 1965 and has recently been awarded Life Membership. 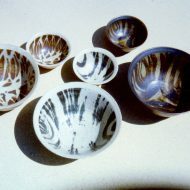 Anne is also a Fellow of the Craft Potters Association. The Guild at 51 is taking this opportunity to celebrate Anne’s career, and during this showcase there will be work for sale from her recent collection. 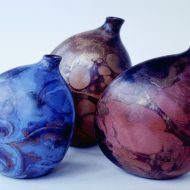 This will demonstrate how Anne has refined her work with burnished lustered Raku. 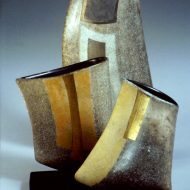 We will also reflect on what has come before, with pieces from Anne’s archive, and look forward to the development of her new high fired work. 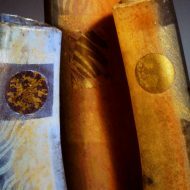 From studying ceramics and textiles at Belfast College of Art, through her teaching and making, Anne has been constantly pushing and developing her skills as a potter. 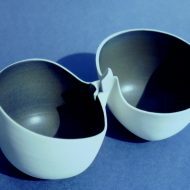 Anne set up her first workshop in Gloucestershire making functional stoneware in the 60’s. 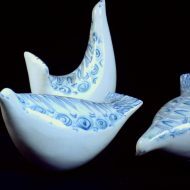 Her first porcelain pieces emerged in 1977. 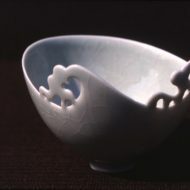 Anne initially made small pieces inspired by landscape and plant forms, which were thrown, carved and very simply glazed. 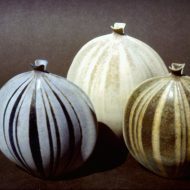 There was then a period of porcelain and stoneware overlap until about 1983, when Anne began glazed Raku. 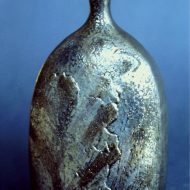 Much of the inspiration for the Raku has been around combining various methods of making including throwing, slab building and drawing on long gathered memories of ancient artefacts and textiles from many cultures. 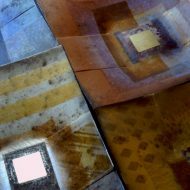 Anne’s work has always been based around materials and process, aiming to create pleasing forms and satisfying surfaces with depth and richness of colour always an important factor. Ideas are, from many and varied sources. 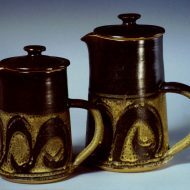 She has always kept sketchbooks, taken photographs and looked at the work of other artists and craftsmen.